Simulated Spanish tile metal roofing allows building owners to capture all of the benefits of a metal roof like longevity, wind and fire resistance, and energy efficiency while maintaining the classic look of ceramic tile. Authentic ceramic tile has a couple of downsides that can make it less than ideal. First, when installing a ceramic tile roof the installation of the individual tiles can be time-consuming. Also, each of the tiles weighs significantly more than other roofing materials. Ceramic tiles are inherently heavy which can mean increased transportation costs when installing a ceramic tile roof. A simulated Spanish tile metal roofing solution, on the other hand, not only has all of the benefits of a metal roof it also addresses these issues. First, a system like Met-Tile is a panelized roofing system. This means that rather than individual pieces Met-Tile comes as panels that are shaped to mimic individual tiles. Installing a panelized system like this takes a fraction of the time required by the installation of real ceramic tiles. In fact, a single Met-Tile panel can cover as much area as 80 individual ceramic tiles. And when it comes to weight, Met-Tile is manufactured from 26-gauge steel and is a fraction of the weight of ceramic tile. This means lower transportation costs, but it also is a benefit in high wind prone areas. In high wind situations, like hurricanes, ceramic tiles often become high-velocity projectiles causing property damage to neighboring structures. This isn’t an issue for Met-Tile because it weighs less, is not made up of individual pieces, and is installed in such a way as to be highly wind resistant. 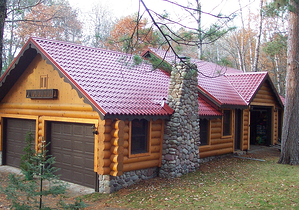 We’ve already discussed some of the features and characteristics of Met-Tile, our simulated Spanish tile metal roofing, but this style of metal roofing really is a high performing roofing option. Ideal for both commercial and residential applications, Met-Tile features a stucco embossed galvalume substrate with a wide selection of low gloss, fade, and chalk resistant PVDF (Kynar 500) coating colors. It’s easy to find a Met-Tile style to fit your buildings needs and aesthetic. Met-Tile is a lightweight, energy efficient, and aesthetically attractive roofing solution equally well-suited for new or retrofit projects. Met-Tile also offers a fire rating of Class A and Class C for new construction, depending on the substrate selected. The Florida Building Code is FBC #17905.1. There are many roofing options available to building owners. In fact, our eBook, Need a New Roof? How Building Owners Reduce Cost with a Metal Roof was written specifically to help building owners understand the options available to them. Follow the link below to download your copy of the Need a New Roof eBook and learn more about your roofing option.